The State of California offers two plans for individuals with pre-existing conditions who have been denied coverage and have been uninsured for at least six months: the Pre-existing Conditions Insurance Plan (PCIP) authorized by the Affordable Care Act and the Major Risk Medical Insurance Program (MRMIP). Both programs are managed by the Managed Risk Medical Insurance Board (MRMIP). The PCIP will remain in place until December 31, 2013 when national health reform is set to begin. After that date, there will no longer be a need for high risk pools because federal rules will not allow insurers to reject persons with pre-existing conditions or charge them higher rates. The premium cost of available insurance is higher than the cost of the MRMIP preferred provider organization (PPO) in the applicant’s geographic region. 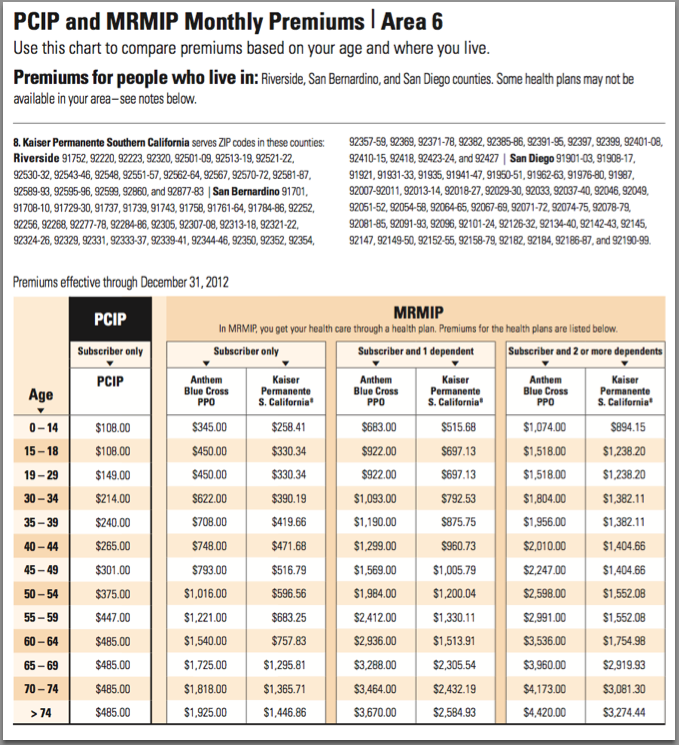 The table below lists the 2012 premiums for San Diego County. The Pre-existing Condition Insurance Plan (PCIP): The PCIP was established through a federal grant under the ACA and is funded by the federal government. The Major Risk Medical Insurance Program (MRMIP) is a State funded-plan that has been available for many years for those who have become uninsurable due to their pre-existing condition(s). You will select your plan of choice on the application form. If you do not state a preference, you will be enrolled in the PCIP if you meet the eligibility requirements. Step 2: Download the handbooks, instructions and applications for the PCIP and for MRMIP. Handbooks, instructions, and the required forms for each of the programs are available at California’s PCIP website. Step 3: Include the following four items with your application. Proof of pre-existing condition in the form of a rejection letter generated in the last 12 months (or) a quote for insurance that has a higher monthly premium than what the MRMIP Handbook lists as the MRMIP PPO rate in your geographic area. A letter of Indian Heritage from a California Indian Health Service Clinic. Copy of unexpired immigration documents or other forms listed here. A personal check, cashier's check, or money order for one month’s premium payable to the Managed Risk Medical Insurance Board (MRMIB). Caution: Please validate the accuracy of the information in the table below by downloading the most current table. Monday - Friday, from 8 a.m. to 8 p.m.
Saturday, from 8 a.m. to 5 p.m. Send a letter to the PCIP and tell them the factual reason why you think their decision is wrong. Complete an Appeals Form which you can download from the PCIP website using this link Appeals Form. Include any other information you think will be helpful in our review. Be sure to write your Member Number on every document you send to the PCIP.